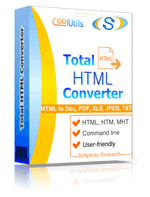 Total HTML Converter is a professional solution to convert HTML to PDF, DOC, XLS, JPEG, TIFF, EMF, TXT, RTF, TXTW, ODT in batch. So if you have to turn thousands of HTML pages into other formats Total HTML Converter is the right solution. It converts HTML/HTM/MHT files via user-friendly interface or command line. If you need more information please contact the developers of Total HTML Converter (CoolUtils Development), or check out their product website.